Way of the Wicked binnen de Wereld der Magieck - 156 pagina's bekeken afgelopen 24 uur! First settled by the dwarves and later progressive waves of human settlers, the Cambrian Bay area is located at the southernmost reaches of the island, and enjoys a mild climate. The fishing is legendary by both the sea and the bay. The capital commands entrance to the rich Bay beyond, and the land upon the nearby peninsula is rich and arable. A rolling countryside of quaint villages, endless farmlands, and small stretches of forest. Heartland lies nestled between mountain ranges, and encircles Godscar Bay. Most of Talingarde’s rural population can be found here. Located between the Heartlands and Savage North, this border region represents the limits of Talirean power. 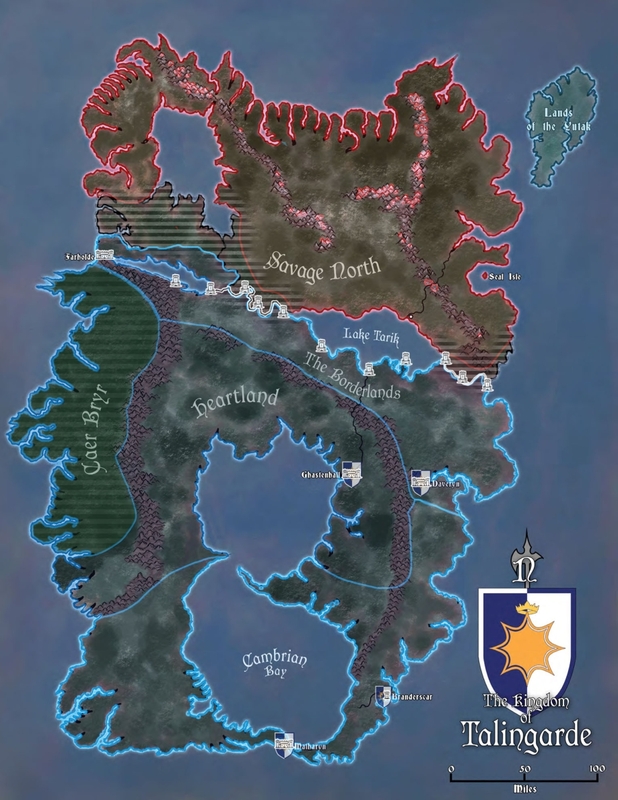 Unable to fully conquer the north, King Accarius IV the Architect of House Barca constructed the first version of the Watch Wall – the Accarian Line, with eight castles guarding the border. Later Markadian I the Victorious would add three more. A massive forest dominates the western frontier of Talingarde. Small border towns flourish in the less wooded south but the northern wood remains a land of mists and legends. There are tales of dragons, and ancient evils haunting the woods. The barbaric Iraen, tribes of primitive humans, inhabit these woods, are self-governing, trading primarily in Farholde. A largely unexplored region dominated by large expanses of taiga forest and plains. Three intelligent races inhabit this region – the Burabur (bug bears), the Naatanuk (polar bears), and mysterious Ice Elves. Long feared, demonized, and ignored by the more civilized south; little is known about this part of the island. A small chain of islands inhabited by short humans known as the Yutak. Seen as cold inhospitable islands by the South, the Yutak see oceans teeming with fish and seals. They primarily travel in one-man kayaks, plying the seas for fur and blubber, and live in small villages hugging sheltered coves. Gepost door Jeff op 10 februari 2015 om 23:19 uur. I worship the quicksand he walks on.